Archer Athletics has continued to find success this spring, building on the momentum of the fall and winter sports. 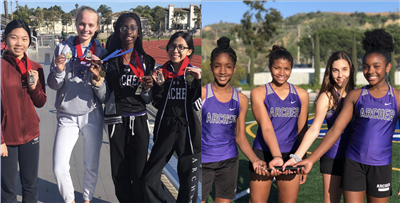 Read highlights for beach volleyball, softball, swim, tennis, and track and field on the Archer website and follow Archer Athletics on Instagram for more updates. Tennis: The Purple team is making a name for itself this season, not only because there are three sets of twins, but also because the athletes compete in a co-ed league. After a rainy start to the season, the team defeated New Roads and league favorite St. Matthews. Audrey C. ’24 beat the top singles player at New Roads 8/0 while doubles team Emma F. ’23 and Maya B. ’23 dominated in their match, beating their opponents 8/1. The Green team has also shown its strength in the league this spring, beating rival Geffen 4/2 in its opening match at UCLA. Alex M. ’24 competed against the top-ranked singles player, taking him to three games. Doubles team Stephanie H. ’24 and Annie F. ’24, played an enjoyable and high-energy match against Windward, showing tenacity and determination to give their opponents a tough matchup. Track and Field: Eden Oje 25' led the Pacific Basin League in the 6th grade 60-meter race and finished in the top five for long jump. Chloe H. '24 led the league in the 400-meter race with a time of 1:02. The 4x400 relay team also took first place at its first Pacific Basic League Meet at West LA College. Varsity Swim: Archer Swim is off to a strong start this season. The team has dominated the Coastal League with consistent dropped times by Betsy G. ’20 in the 100-meter backstroke, Leah A. ’22 in the 50-meter breaststroke, and Juliet Y. ’19 in the 100-meter race. Ella S. ’19 and Marie C. ’19 have led the way in the 500-meter freestyle race. Freshman Thea L. ’22 has qualified for CIF in all possible events, and Archer’s 200-meter and 400-meter freestyle relays have qualified with CIF consideration times. Varsity Beach Volleyball: The team competed against rival Notre Dame Academy on Thursday, March 14, at the Annenberg Beach House. Gillian V. ’20 and Bella M. ’21 led the way and won in straight sets against Notre Dame Academy’s No. 1 team. Yassi S. ’19 and Arielle J. ’20 kept the next matches to two points, setting up Seniors Stella S. ’19 and Jenna M. ’19 to earn the clutch rematch win against Notre Dame in a tiebreaker set. Varsity Softball: The team kicked off its spring season with consecutive wins against University High, Westridge School, and Faith Baptist School with a margin of victory of six or more runs. Freshman Pitcher Faith S. ’22 and Senior Catcher Morgan D. ’19 led the way on defense this past week, guiding their team to wins against Los Angeles High, Malibu High, and Hawthorne High. Varsity Track and Field: The team will head into the heart of its season at the upcoming South Bay Championships. Sprinters Nia M. ’20, Hailey A. ’20, Starrlyn B. ’21, and Giana P. ’21 are leading the way in the 100-meter, 200-meter, and 400-meter races. In Archer’s field events, Miayunique S. ’19 finished first in the Tri County and Zamperini Invitationals and Nadia C. ’21 earned a second place finish in the shot put. Freshmen Katie L. ’22, Lauren R. ’22, Chidimma N. ’22 and Andrea R. ’22 also earned medal finishes in the Zamperini Invitational.